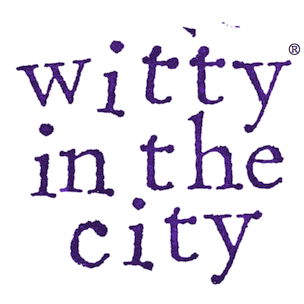 Welcome to Witty in the City’s first ever fish recipe!! As you may know, I have wanted to like salmon for a long time, and my wishes finally came true! My friend and I ordered a salmon dish from my current favorite restaurant of all time, Estadio, and the fish was incredible! The skin was thick and crispy, and the salmon was cooked medium-rare. The bright pink flesh of that salmon was a gateway drug! With no experience cooking fish, I was hesitant to try it at home. But then, my cooking class saved the day with two nights on fish, and I dove right in. 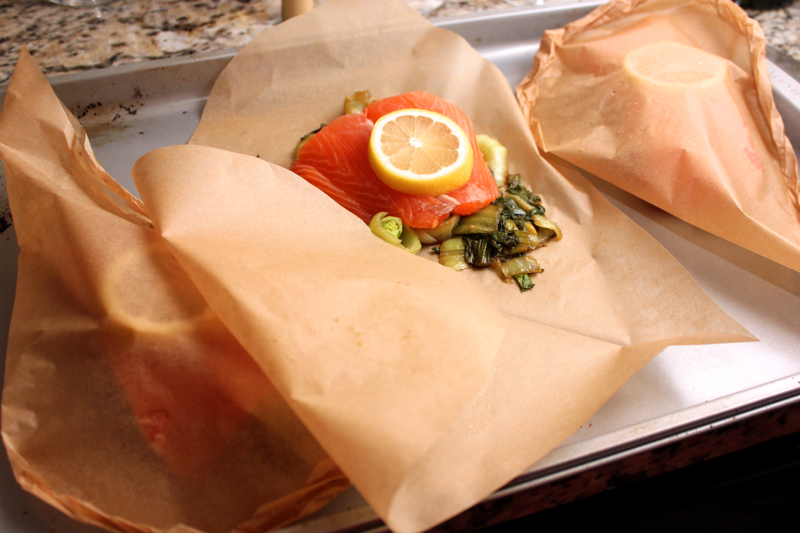 This salmon is nestled on a bed of bok choy, wrapped in parchment paper, and baked. It is easy to master, very healthy, and so delicious. To make this salmon, begin by preparing your vegetables. Heat 1 tablespoon of vegetable oil in a skillet. Mince 1 garlic clove per serving, and add it to the pan. Slice about 1 cup of bok choy per serving, and add it to the pan as well. Sauté the bok choy until it wilts. Then, drizzle in enough soy sauce to lightly moisten the bok choy, put a lid on the skillet, and let it cook over a low heat until the bok choy is tender. While the bok choy cooks, heat your oven to 400º F. Tear off a sheet of parchment paper that is about 1.5 feet long, fold it in half, and use scissors to cut out half of a heart shape. Unfold the parchment paper into a full heart. 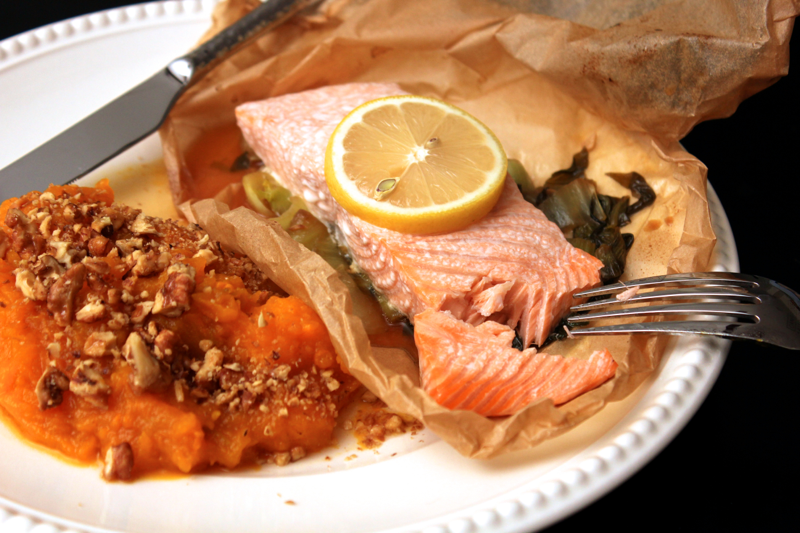 Slice a lemon, and cut a skinless salmon filet into portions. Season the fish lightly with salt. 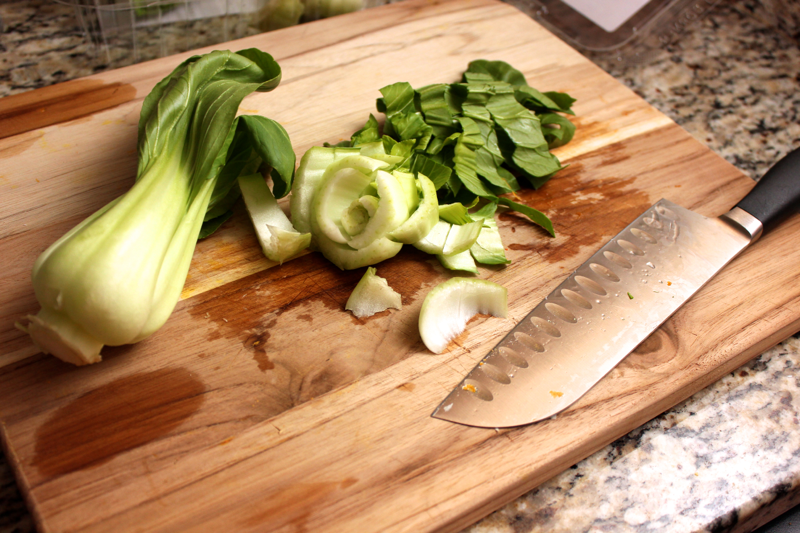 On one half of the parchment heart, pile some of the cooked bok choy. 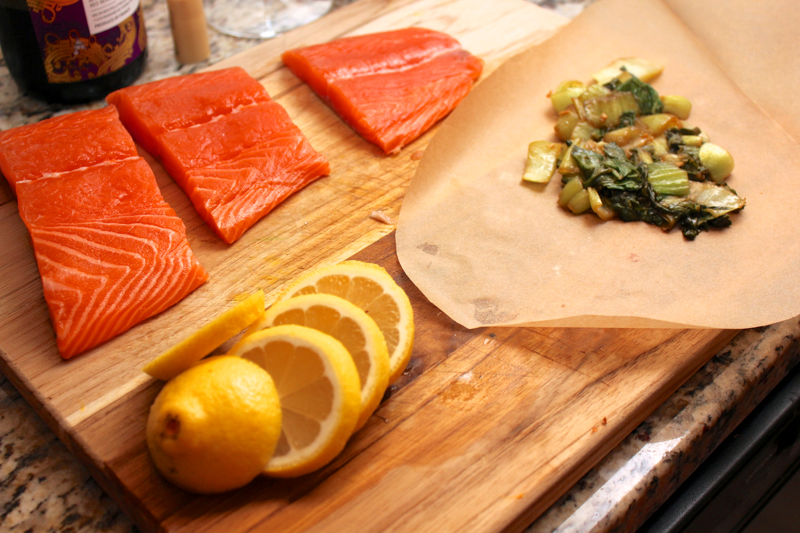 Top the bok choy with a piece of salmon, and top the salmon with a slice of lemon. Fold the heart over to cover the salmon, and crimp the edges to seal it. When about 1 inch of parchment remains open, pour in 1 tablespoon of white wine. Finish sealing the parchment, and place the packet on a baking sheet. Repeat with your remaining packets. 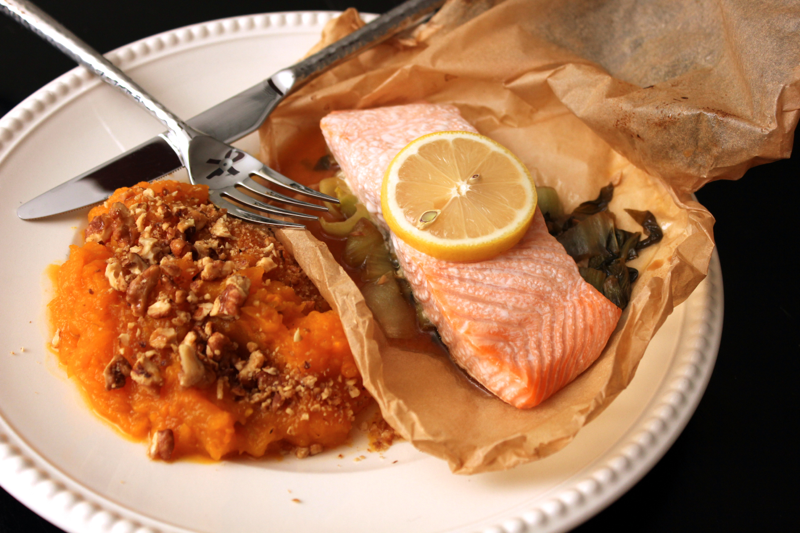 Put the baking sheet into the oven, and cook the salmon for no more than 10 minutes. At that time, the salmon should be cooked through but still moist. 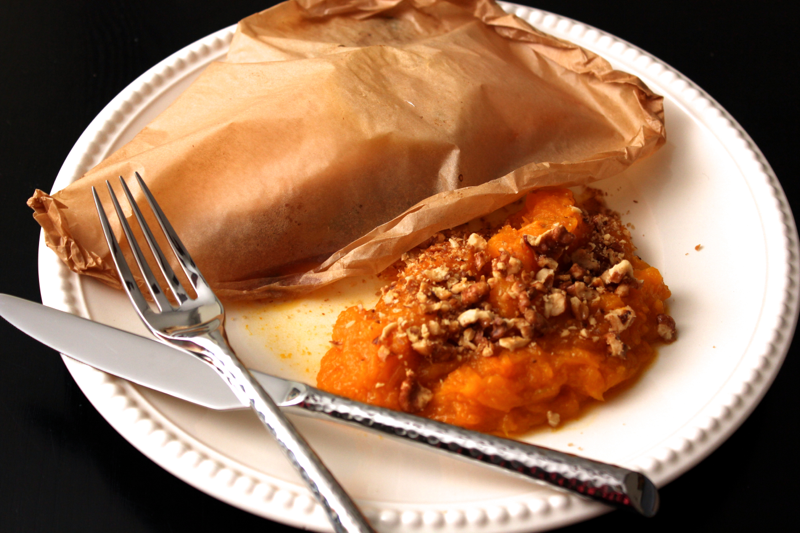 Transfer the sealed parchment packet to a serving plate. Open up the parchment, and look at your beautiful fish! The white wine and residual soy sauce should have steamed the salmon perfectly, and the flavorful bok choy is a savory accompaniment. I still can’t believe how much I love this meal, but I really, really do. I hope this is the first of many more fish recipes I have to share with you!